Noodles are one of the world’s most popular dishes. With all of the ways to personalize them, it’s no wonder. 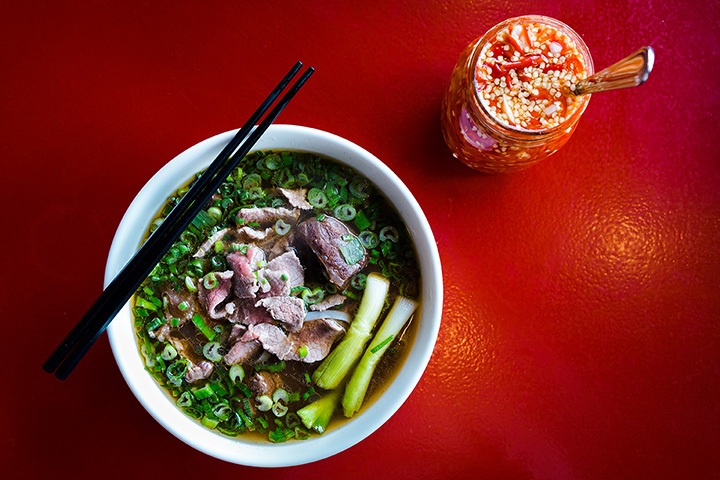 From Thai to Vietnamese to Japanese, mouthwatering noodle options abound in North Dakota. Enjoy a comforting bowl of noodles at these great restaurants throughout the state. Located in trendy downtown Fargo, the Drunken Noodle is an expert on everything noodles, whether Thai, Italian, American, or Vietnamese. The best part? Drunken Noodle is open until 3 a.m. on the weekends, so you can satisfy your late night noodle cravings here! The menu has a variety of choices, but the local favorites are the yakisoba, Pad Thai, mac and cheese, spicy Cajun pasta, fettuccine alfredo, but there is plenty more to choose from including some rice bowl options. Bismarck’s Noodlezip serves up food from Korean, Vietnamese, Japanese, and Chinese so there’s sure to be something for everyone. The menu includes tasty noodle-based dishes like Vietnamese pho, Japanese ramen, shrimp wonton noodle, Korean market noodle, vegetable noodle, spicy seafood noodle, Pad Thai, Korean glass noodle, Sichuan dan dan, Singapore curry noodle, and more. No matter what type of cuisine you like, you’re sure to find a new favorite at Noodlezip! If there’s one thing that Thai cuisine loves, it is noodles. There are so many delicious noodle dishes to choose from at Bismarck’s EAT Thai Restaurant that it’ll be your new favorite eatery! The menu offers unique dishes like Pad Thai, pad see ew, drunken noodles, and plenty other options. In addition to noodle dishes, they also serve plenty of dishes with rice, stir fry, curry, and soup, so there’s a dish for everyone in your party at EAT Thai Restaurant. Thai Hot is another Thai joint serving up authentic and mouthwatering meals with a variety of cuisines represented. This trendy eatery uses only the freshest local ingredients so the meals are out of this world! The noodle dishes are one of their specialties though and includes favorites like Pad Thai, pad see ew, drunken noodle, Thai hot noodle soup, pad woon sen, yaki soba, and more on their huge menu. There are two convenient Thai Hot locations in Minot, one on South Main Street and the other on West Central Avenue. Rice Bowl is a Chinese foodie’s oasis due to the many authentic menu items. This eatery serves up soups, beef, chicken, pork, seafood, fried rice, egg foo young, lunch specialties, and noodle dishes like noodle soup, chow mein, and lo mein. Make sure to bring a giant appetite to Fargo’s Giant Panda Chinese Restaurant, as their portions are huge and tasty! From lo mein to noodle soup to chow mein, there are plenty of noodle-based dishes as well as other favorites like egg rolls, dumplings, chicken, shrimp, fried wontons, fried rice, and much more. You’re not going to want to miss these tantalizing dishes! Oahu Hawaiian BBQ & Sushi Bar is a trailblazing and innovative restaurant that has found its home in Bismarck. The cuisine blends Hawaiian and Thai food for a perfect culinary combination. In addition to shrimp, sushi rolls, and other island treats, there are also plenty of noodle dishes available like yaki udon, seafood soba, Pad Thai, and pad see ew. Minot’s Little Blue Elephant has a welcoming atmosphere with helpful employees and unbeatable food, making it one of the best places for Asian cuisine in town. There are plenty of menu items but the noodle dishes are some of the best. Noodle dish choices are Pad Thai, pad thai woon sen, pad drunken noodles, pad see ew, yakisoba, pho noodle soup, udon, and curry noodle soup.